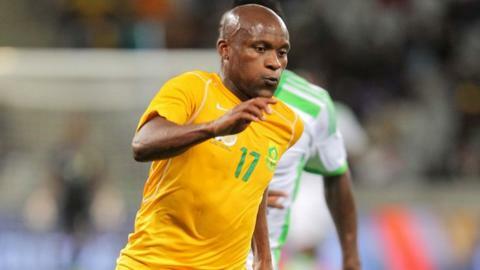 Injured Bournemouth striker Tokelo Rantie, 24, has been named in South Africa's provisional squad for January's Africa Cup of Nations. Coach Ephraim Shakes Mashaba has called up 34 players to attend a training camp between 26-30 December. Rantie injured his shoulder in November in Bournemouth's 2-2 draw with Ipswich and has not played since. But his club have said he could recover in time to play at the Africa Cup of Nations in Equatorial Guinea. Goalkeeper Itumeleng Khune, another player who is returning from injury, has not been included but he has been given some hope of being selected for the 16-team tournament, which begins on 17 January. "For those not on the list, we can't say for sure they are completely out, they also stand a good chance of making it," Mashaba said. "It is an opportunity for all of them [on the list] to book their spot in the final squad." The coach will names his final 23-man squad on 30 December after the completion of the training camp. Bafana Bafana are in Group C with Algeria, Ghana and Senegal at the finals in Equatorial Guinea.